Hey guys! Jessica here with The Hook Nook again! 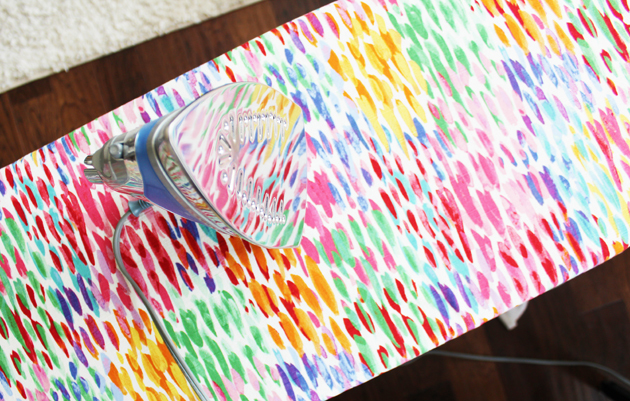 I have a SUPER exciting DIY project (well, LOTS of projects) to share with you today! 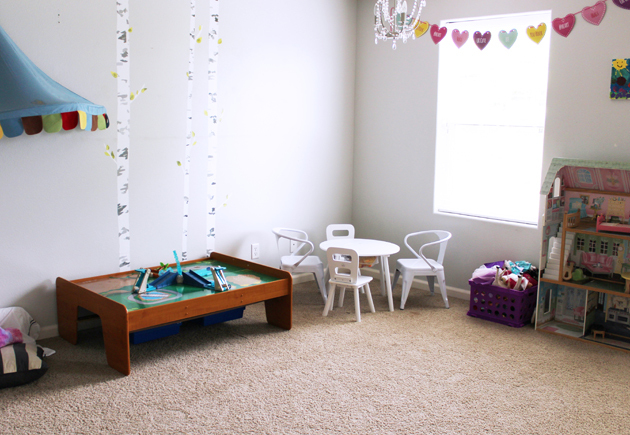 We moved into our home just over a year ago and I’ve been DYING to get my kids’ playroom all set up and beautiful! 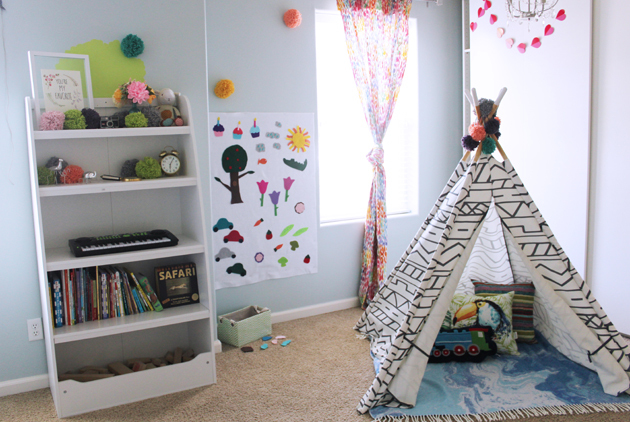 Inspiring creativity for my littles is super important to me, and I think I did a pretty great job at accomplishing a super FUN room for them to play in! Let me show you! Here are my before photos. 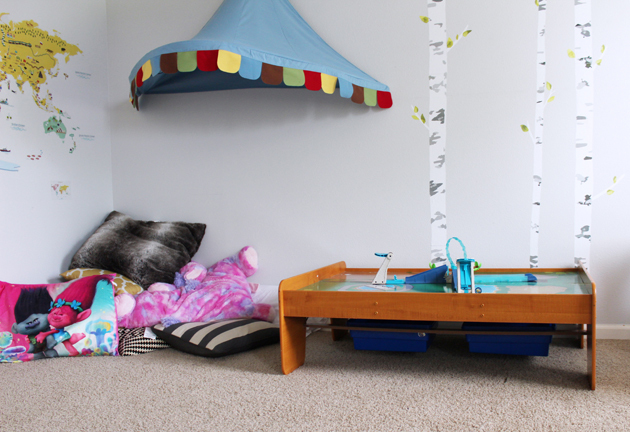 It was a relatively basic (LARGE) room with minimal decor and ALL the toys. 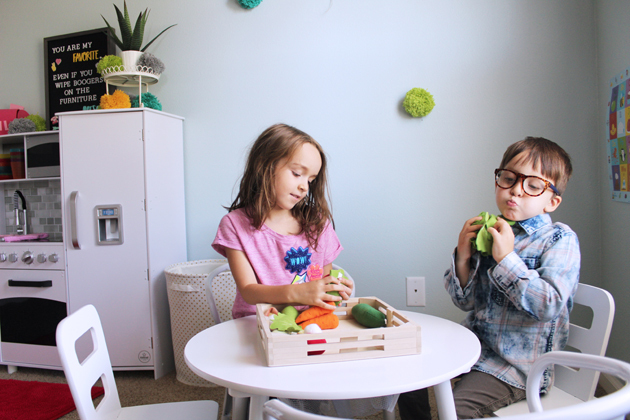 Though my kids had fun in this room, I really wanted to liven it up and make it a fun place for them to be eager to play in. First, I Amazon’d it up and got some pretty white furniture to keep it all cohesive and matching. While I waited for those items to arrive, I happened to find a full gallon of unused blue paint AND all of the painting materials and tools I’d need to get the job done in my garage, left by the previous owners. Best part? The blue was PERFECT for igniting joy in the room! Good color choice previous owners! I spent an evening getting the whole room painted and spent the next day putting together furniture. But now the FUN stuff. A few years ago I purchased this awesome bench from a friend at her garage sale. I’ve ALWAYS wanted to make a seat for it (there was a perfect lip to fit one) but I just hadn’t had the time or motivation to actually get it done. 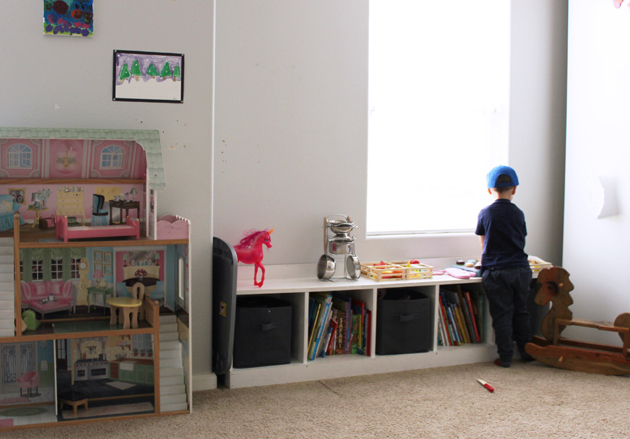 Well, a play room makeover was the PERFECT reason to finally get that idea out of my head and into my hands. 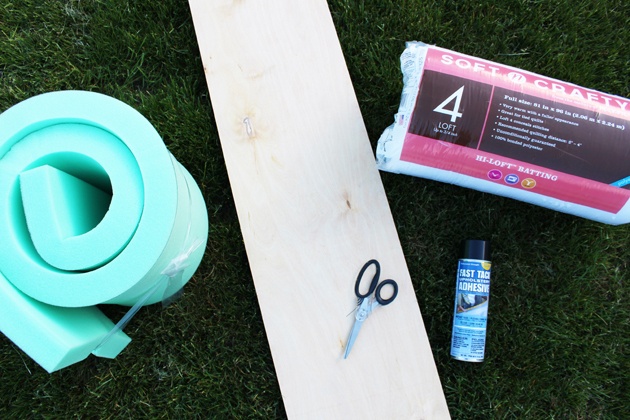 Notes: Measure your desired bench space before going to your local hardware store to get your thin board and your local Jo-Ann store to get your foam cushion, and the rest of your supplies. At both locations they were able to cut the materials to my exact needed size -for free - which was incredibly helpful! Also, I was able to get my board for free because they randomly had something thin enough and large enough in their scrap pile! Double score! 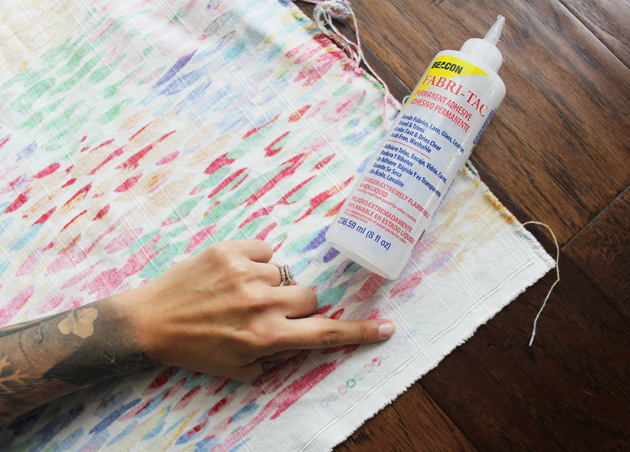 Find a place that is well ventilated (the spray glue has a strong smell) and large enough to complete your project. I went to my backyard! Spray the spray glue onto one side of the board and let sit for about 10-15 seconds. Gently, and carefully, lay the foam cushion onto the board. Remember to keep the cushion and board lined up properly. The tacky glue is difficult to work with once set! Spray the spray glue onto the cushion and lay the batting onto the glued cushion. Turn the three-layered piece over so that the batting is on the bottom and the board is on top. Spray the board with the glue and cover with batting. Lay your fabric face-down. 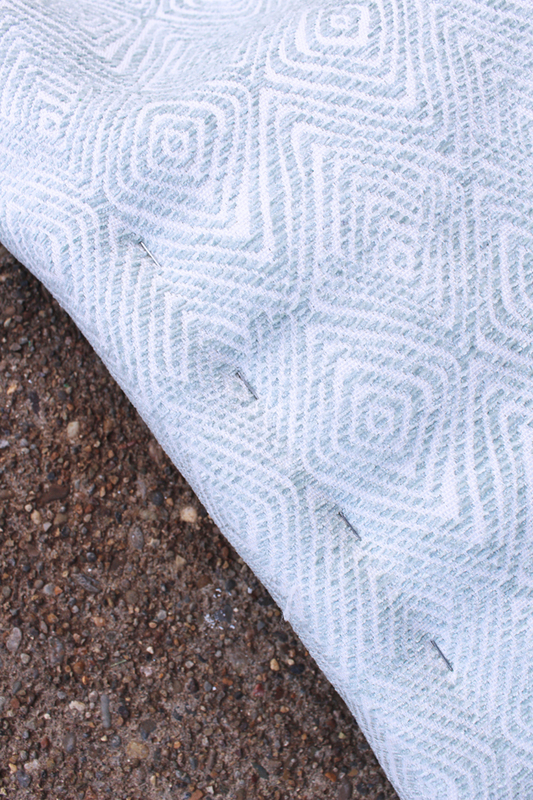 Lay the batting-covered piece with seamed side up, on top of fabric. 7. 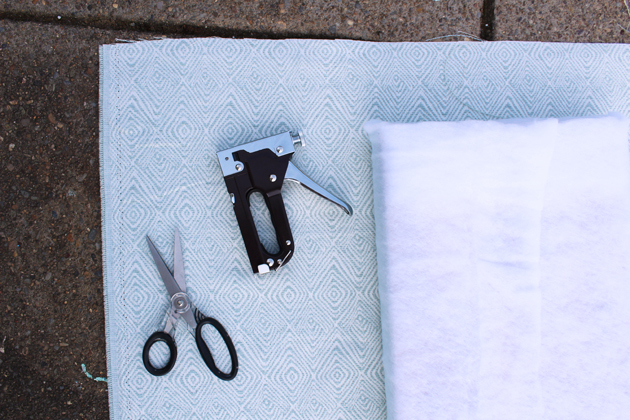 Fold fabric onto board and use your staple gun to secure it in place. Continue down long side of board. 8. Remembering to keep fabric tight, fold other side of fabric over board as well. 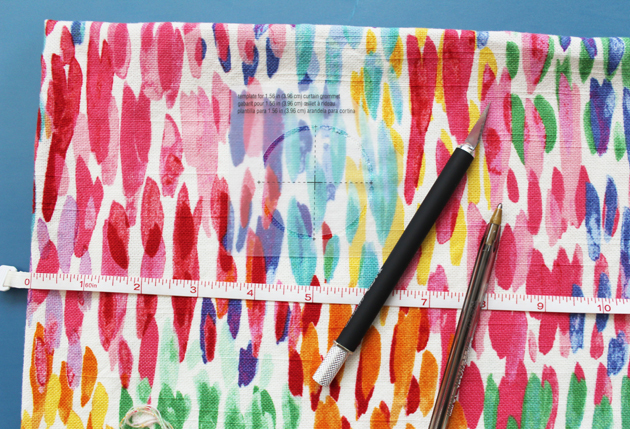 To create a clean edge, fold edging of fabric before stapling (see photo). 9. 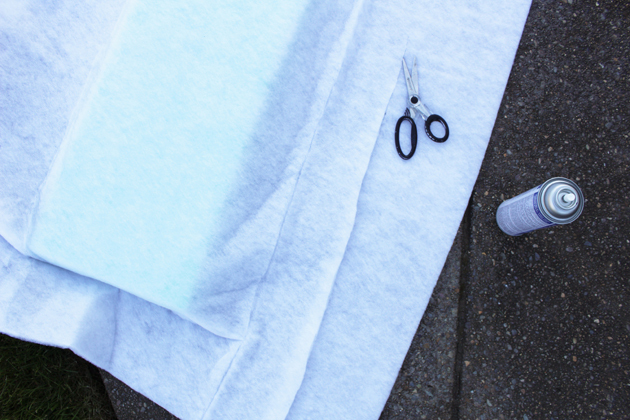 Fold short ends to underside and staple into place. Voila! You now have a bench seat! Ok, I know you’re waiting to hear about the big PLAY letters up there! Easiest. Project. Ever. 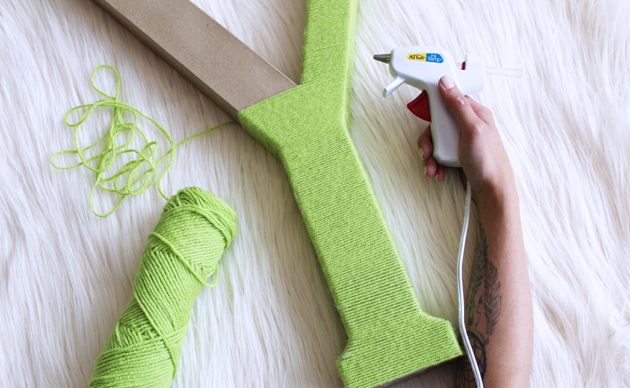 I found some super large cardboard letters at my local Jo-Ann store and used some yarn to wrap around it using hot glue to secure yarn in place. This project was quite a bit labor extensive and took quite a bit of time, BUT I think it was TOTALLY worth it! What do you think?! My daughter LOVES to paint. 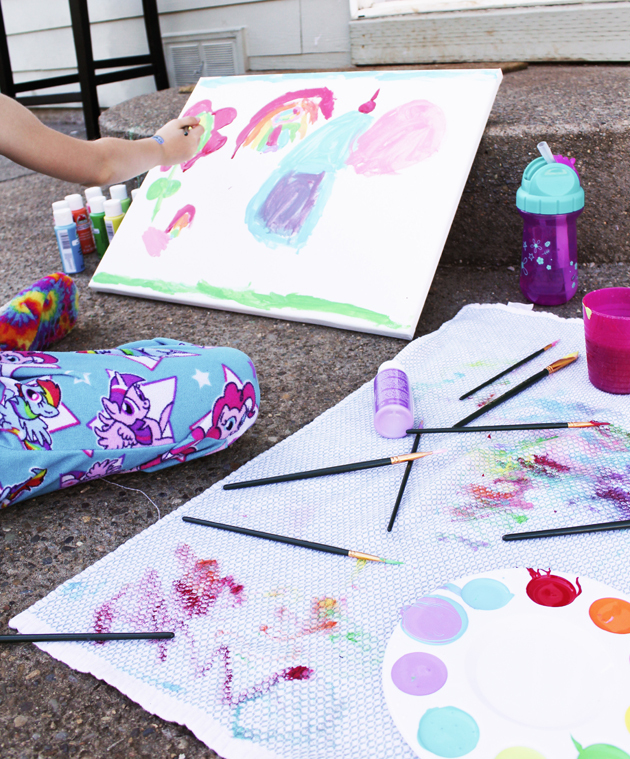 She’s such a little artist and LOVES color. 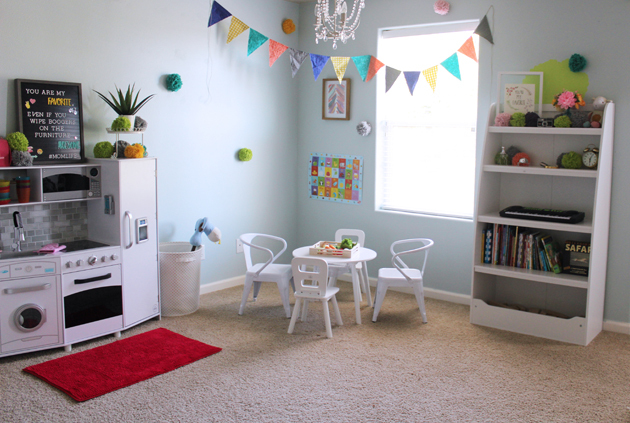 I really wanted their play room to feel like their play room. 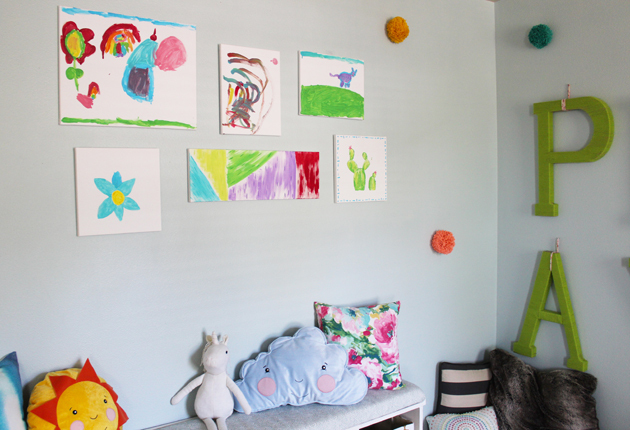 I had the kids help me decorate the room by having them paint on canvases that I could arrange as art on the wall. My daughter was SO excited and I think it was a fun way to bring personality and additional color into the room! The previous owners had placed the chandeliers in this room and I just love them! I love how much the light plays off of them so I didn’t't want to hinder too much light but I still wanted to make a window treatment to add even more color and interest into the room. So… I made a curtain from scratch and totally made it up as I went - BUT - I’m pretty darn proud of my first attempt at anything similar. **I’m totally sweating over here hoping that none of the real fabric enthusiasts get upset with how I did this.. I promise I meant no harm.. Ha! 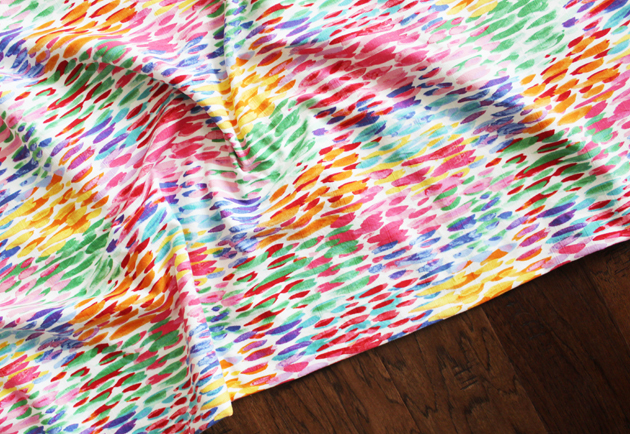 First, I found some BEAUTIFUL fabric that was bright, creative and just HAPPY. Boom - easy pick. However, I wanted to loosen up the fibers in the curtain and - wait for it - washed and dried the fabric. Don’t hate me. I just like the feel of washed fabric.. I then ironed it all out so it was all pretty again. The fabric did get snags but I liked the distressed style it gave it - worked great for it being a play room! Next, I folded in the edges so that about an inch of the patterned side was on the backside as well and glued it down with fabric glue. When gluing down the top side, I made sure to leave a 5” hem to use for the grommets. I love the look of grommet curtains and when I saw some DIY curtain grommets at my local Jo-Ann store, I knew I wanted to use them. I followed the directions on the box and it was way easier than I had even anticipated! Simply measure the width of your curtain and divide that number by the number of grommets you want to use. Space the center of the grommet onto that measured mark. 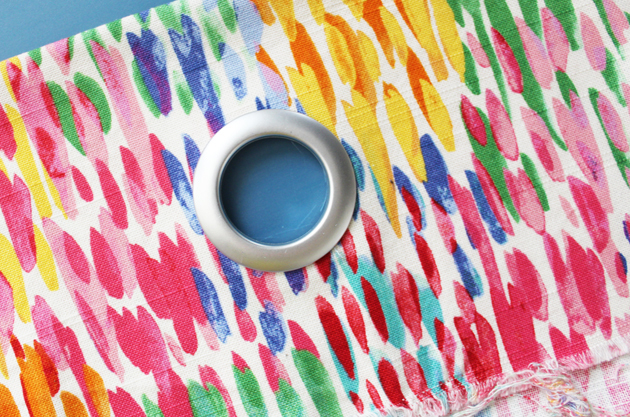 Using the included stencil that comes with the grommets, mark the circle it shapes out with a pen or pencil. 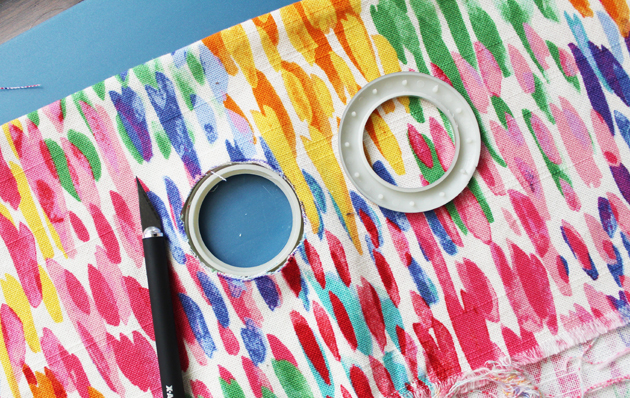 Using an X-Acto knife (and having a cutting board underneath the curtain), cut out the stenciled circle completely. 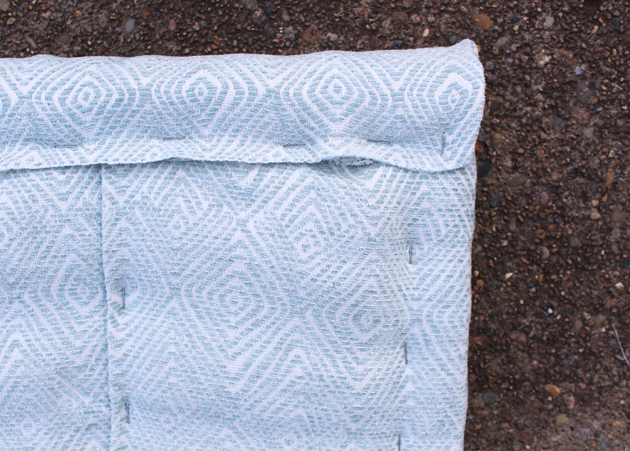 Place grommet into position and secure together by pushing the two pieces together, interlocking them. 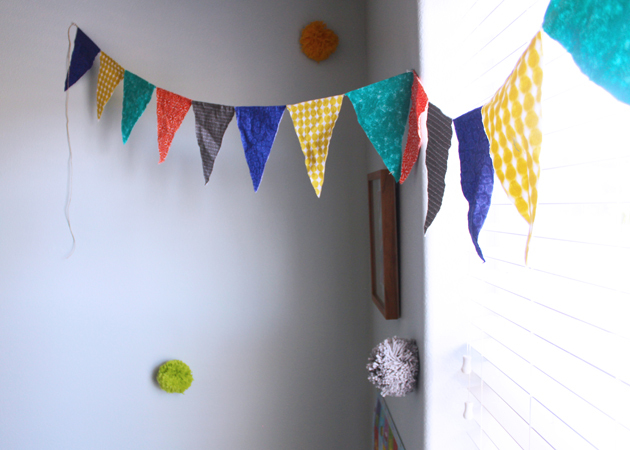 I really wanted to keep the room colorful so I knew I wanted to make a bunting piece for the corner of the room. 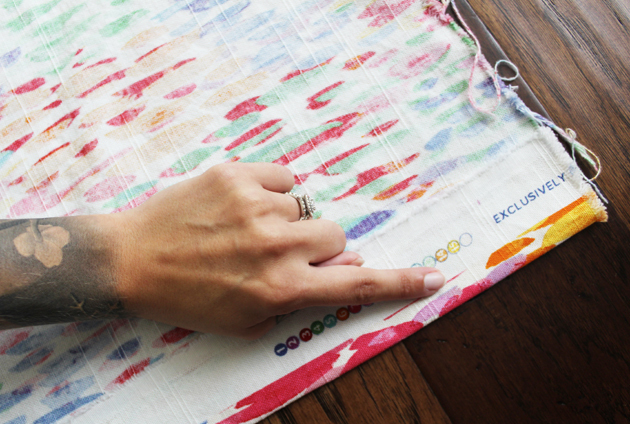 I grabbed different colored fat quarters from my local Jo-Ann Fabric and Crafts Store, some hemp cord and hot glue. I then drew a diamond shape on the back side and cut out as many as I could. I then laid a long piece of hemp cord over the center of every piece and used hot glue on the hemp cord and outlined one side of the diamond as well. I then folded over the other unglued side of the diamond and secured it onto the glued side, creating a double-sided triangle. I repeated this for each diamond and VOILA! 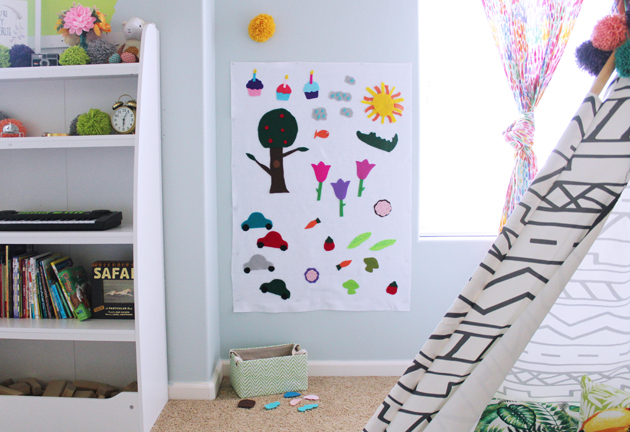 So, I’ve seen those cool felt Christmas trees that blow up all over Pinterest during the holiday season and I wanted to incorporate that idea into the play room. 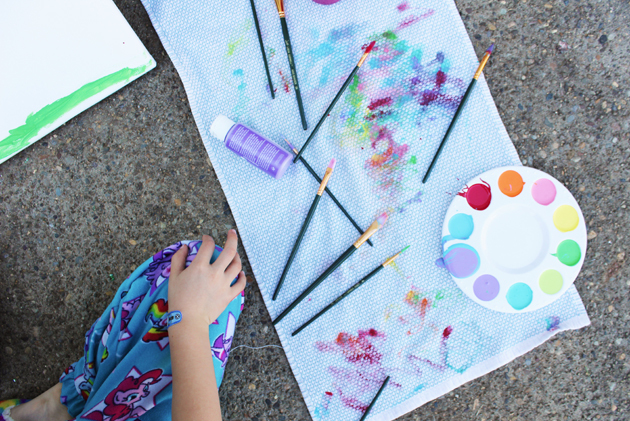 My son loves to imagine and pretend and my daughter loves to be creative and DO things. I thought this was a fun way to marry those two things - and I was right! They sat for about an hour creating different “scenes”. I’m going to need to cut out some more felt for them to explore new ideas! 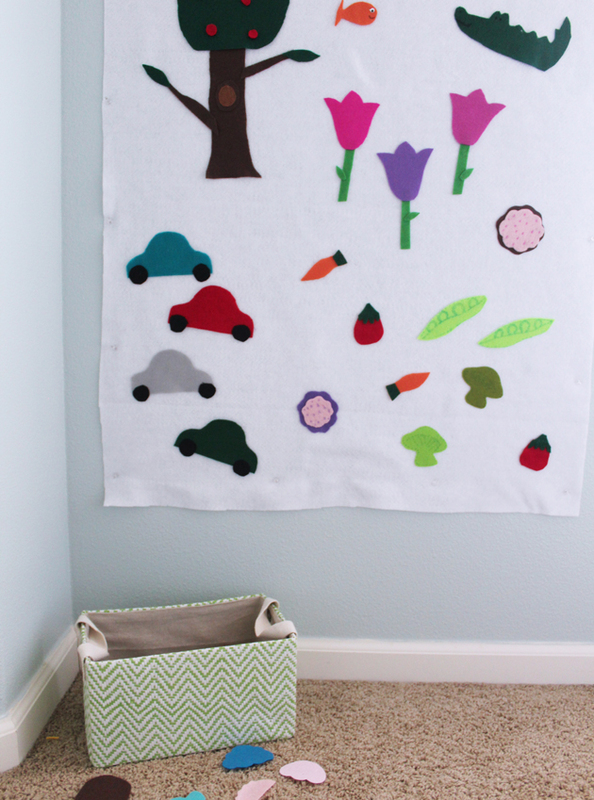 To create this felt board, I purchased about a yard of white felt from my local Jo-Ann store (and it was on sale!) to use as the background. I then purchased numerous sheets of different colored felt and cut them all into different themes - food, animals, plants, sun, clouds, cars, etc. I think this project is the biggest win with my kids! 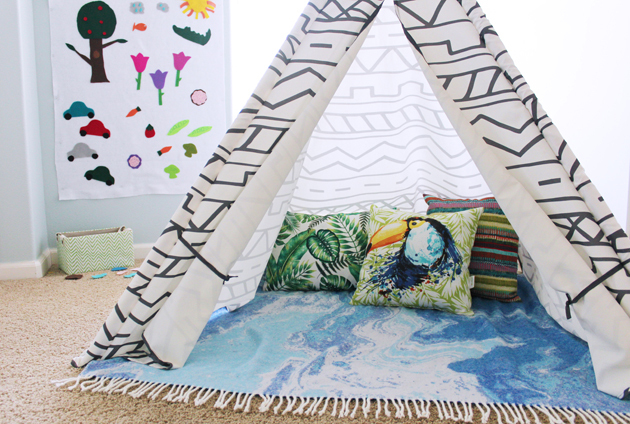 I found some amazingly colorful outdoor pillows at the store as well and used them in the teepee as well as on the bench! Texture. I LOVE texture. 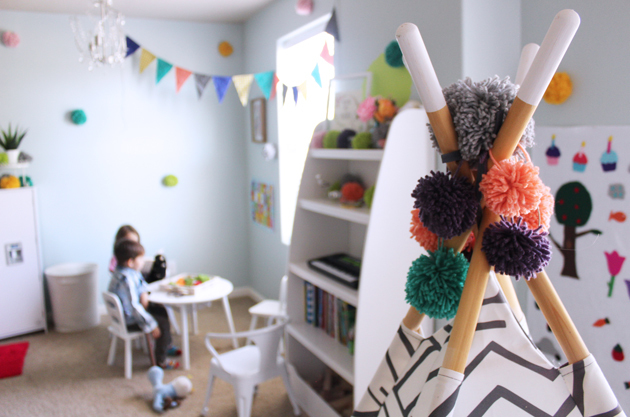 I had a super fun idea to find a new way to do polka-dot walls by simply attaching poms to the wall! Voila! 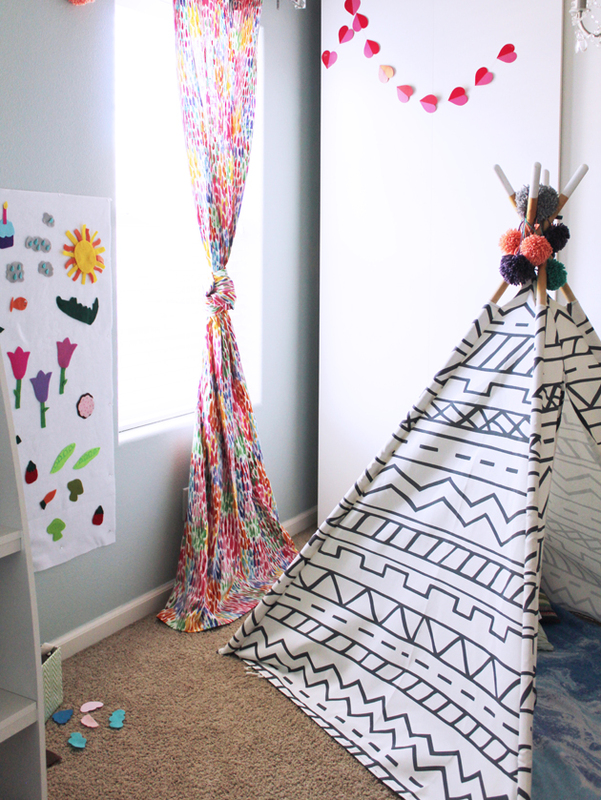 (You can learn how to make a pom using Clover pom makers here) I used both Large and Extra Large pom maker sizes but mainly used the Extra Large size for the walls, the Large size for hanging poms on the teepee. My kiddos are a bit older (4 and 6) so with that in mind AND placing them up a bit higher for when we have wee friends come over to play, I simply used push pins to attach them to my wall. 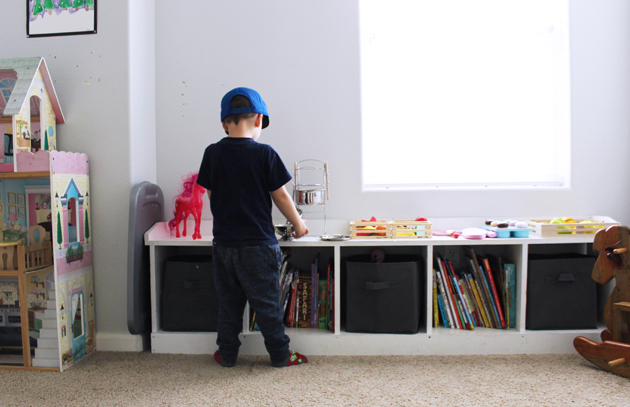 Another way to get them to hang without putting a million holes in your wall, is to use 3M Command hooks. To do this, you’ll need to leave a couple tails when completing your pom, tie them together to create a loop. Hang the loop on the 3M Command Hook and ta-da! No potential ouchies for the littles. 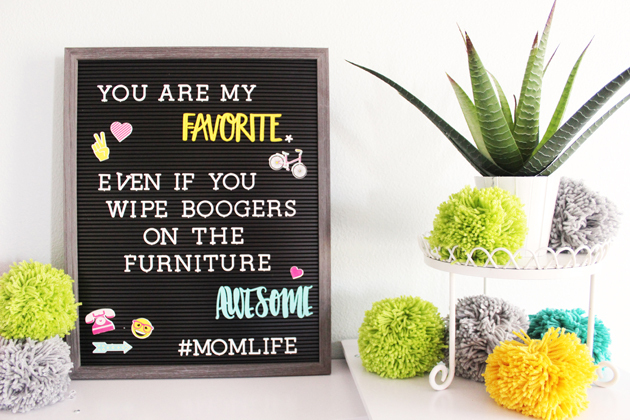 One of my favorite personalized pieces I added to the room was this letterboard! The saying can’t be true for only my kids, can it?! Ha! So in love with the add-on options for this product! I used the 2” white letters, “Happy” letter board words, and these fun emoji-inspired “Happy” letter board icons!! SUCH a fun piece!! Phew! I worked pretty darn hard on this room (and had the help of some friends!) and am SO beyond thrilled with how it turned out. When my kids saw it for the first time with the noms all over, my daughter yelled, “IT LOOKS LIKE A PARTY IN HERE!! !” I’d definitely call that a mom win. Again, I’m over the moon happy with the end look and I sure do hope you enjoy it as much as we are. Hard work really does pay off!